Warner Bros. Animation and DC Entertainment bring one of the most momentous Teen Titans plotlines in comics history to animated life with the all-new, feature-length film Teen Titans: The Judas Contract. Inspired by the 1984 DC story arc from Marv Wolfman and George Pérez, Teen Titans: The Judas Contract will be distributed by Warner Bros. Home Entertainment on April 18, 2017. Check out new box photos and animation stills in the gallery below! The landmark Teen Titans story will be available on Blu-ray Deluxe Giftset ($39.99 SRP), Blu-ray Combo Pack ($24.98 SRP) and DVD ($19.98 SRP) starting April 18, 2017. The Blu-ray Combo Pack includes the movie in high definition on Blu-ray Disc, a DVD, and a digital version of the movie on Digital HD with UltraViolet. The Blu-ray Deluxe Edition will include all components of the Blu-ray Combo Pack, along with an exclusive figurine of Blue Beetle in a numbered, limited edition gift set. 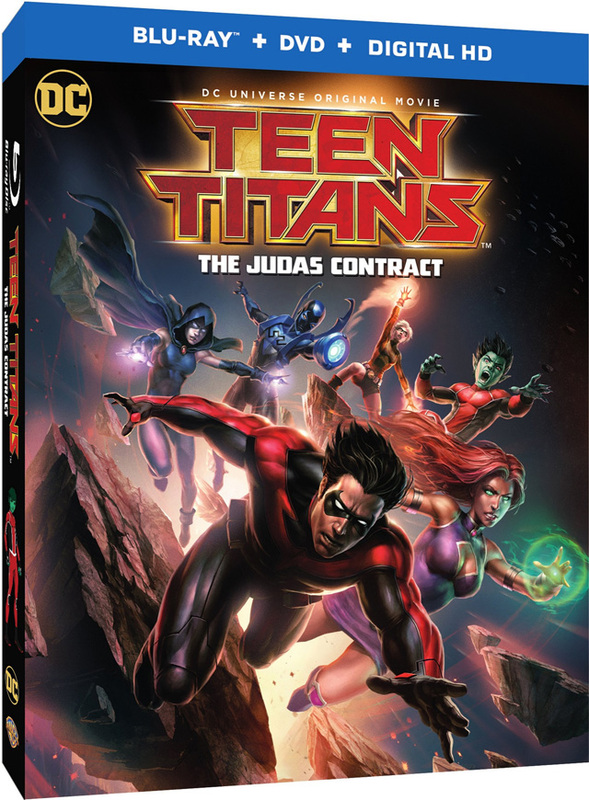 Teen Titans: The Judas Contract will be released via Digital HD on April 4, 2017. Led by Starfire, the Teen Titans – Beast Boy, Raven, Blue Beetle, Robin and the just-returned Nightwing – have built a cohesive team in their never-ending battle against evil; but their newest teammate, the mysterious and powerful Terra, may be altering that dynamic. Meanwhile, an ancient evil, Brother Blood, has awakened, and familiar foe Deathstroke is lurking in the shadows – both waiting to pounce. Ultimately, the Teen Titans will need to battle their enemies and their own doubts to unite and overcome the malicious forces around them in this twisting tale of intrigue, adventure and deception. Christina Ricci (Zelda, Sleepy Hollow, The Addams Family) and the late Miguel Ferrer (NCIS: Los Angeles, RoboCop, Crossing Jordan) join the already-established Teen Titans voice cast as Terra and Deathstroke, respectively. 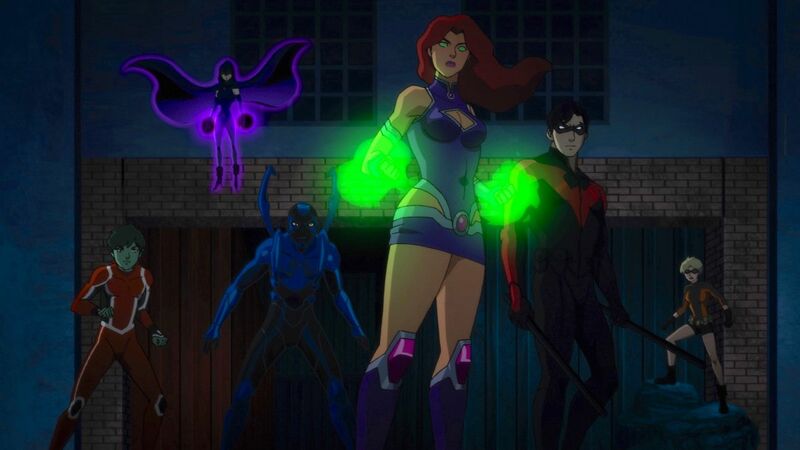 Returning Titans actors include Sean Maher (Firefly/Serenity, Batman: Bad Blood) as Nightwing, Taissa Farmiga (American Horror Story) as Raven, Jake T. Austin (Wizards of Waverly Place, The Fosters) as Blue Beetle, Brandon Soo Hoo (Tropic Thunder, From Dusk Til Dawn: The Series) as Beast Boy, Kari Wahlgren (Phineas and Ferb, Legion of Superheroes) as Starfire, and Stuart Allan (Batman vs. Robin, Batman: Bad Blood) as Robin/Damian. Gregg Henry (Scandal, The Killing, Payback) voices the villainous Brother Blood.